We got up and took a nice warm shower before breakfast at 8 with Louisa, Linda, Julie and Christina. Everyone had good plans for the day. After breakfast I wrote a fundraising request for Achuar resort management education. Then we went for a walk to find another memory stick for the camera and found a 4gb for about $75. We had totally used up our 2gb stick. 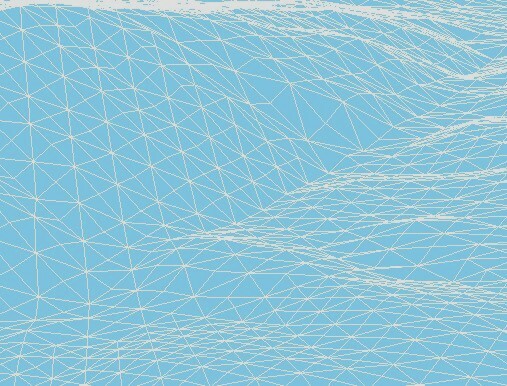 We got on the internet and saw how Hurricane Gustav was just hitting the Louisiana coast. We got our VISA pin # in case we ran out of money – it appeared inevitable. And we typed up the fundraising request and sent it off to Lynne Twist for editing. We went through our small collection of clean clothes and picked out some dirty clothes to send off to get cleaned. 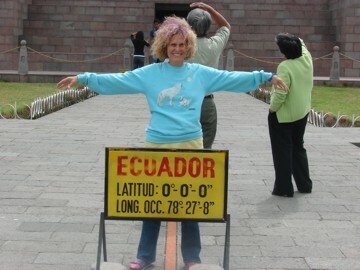 Charlotte organized someone to drive us to the Middle of the Earth (the equator). At 1pm Paulo showed up in a Kia with his daughter who started 7th grade today and we headed off through a lot of traffic to the very north end of Quito. 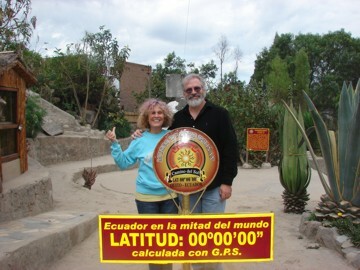 We saw the huge monument and the equator line. It was fun hopping back and forth from fall to spring and back again. We paid a couple more bucks and went to the top of the monument. 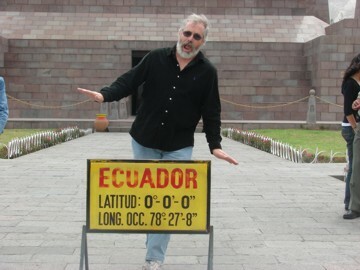 We had a feeling this wasn’t the real equator. We had heard that the latest GPS technologies showed it was off. But darned if we could find the right place. Finally someone gave us a clue – 200 meters to the north. To get there you had to leave the park. 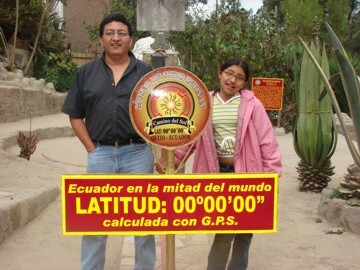 We got Paulo and his daughter, who were waiting for us and we found the real equator and this time we paid for all of us to take a guided tour. We saw a season sun dial and then a glass ball with a strip of paper under it with the times of day. When the sun was shining it burned a hole through the paper so you could track the intensity of the sun through the day. Then we saw a 2 sided sun dial – one for the sun when it was in the north and the other for the south. 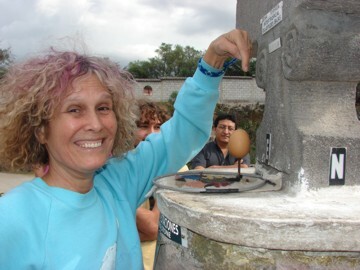 Then we did the famous water draining experiment, and sure enough water drains straight down at the equator and Charlotte caught it on video. 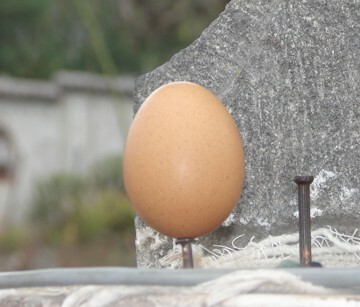 Then we tried our skills at balancing an egg on a nail and sure enough with a little effort we did it. Next we tried walking a straight line down the equator and then tried an experiment to see if gravity is a bit stronger right at the equator. I didn’t find that experiment very convincing but I think Charlotte did. After that we did a little tour through some indigenous exhibits. Saw a shrunken head, a huge boa constrictor and a couple even longer anaconda skins. We headed back to the hotel, happy that the weather had cooperated with us.